Over the last month, thousands of students have been buying textbooks for their classes from the UBC Bookstore. Many, if not most, will leave with an item they did not pay for, will only use once, and will throw away almost immediately: a plastic bag. The Bookstore provides tens of thousands of these bags to students throughout the year at zero cost to students but with a gargantuan cost to the environment. Last summer when UBC stopped providing single-use plastic straws they made the first of many tiny steps in the right direction to curb the use and creation of unnecessary plastic waste. This semester, they need to go a step further. The next step UBC needs to take will save the institution money, stop the proliferation of waste and make UBC ever-so-slightly greener. The next step is stopping the distribution of single-use plastic bags. Asking UBC to make this step is incredibly small but also impactful. If UBC possess the environmental care it espouses to have, this would have happened long ago. In fact, many other small steps could have happened long ago, but the second-best time to make those changes is now. We all know that single-use plastic is incredibly common in our daily lives, from the lid of your coffee cup to the water you bought at the vending machine. Single-use waste is estimated to be 10 per cent of everything we discard. That’s a staggering number for things we often use for less than 15 minutes. Now let’s say that UBC thinks this is too big a change, it’s simply too hard to implement, it doesn’t believe that it has the institutional power to make this change. Well, 74 countries have initiated either full or partial bans of single-use lightweight-plastic bags, many of them impoverished nations with weak institutional power, and many similar countries have bans planned within the next few years. If UBC wants to argue that it doesn’t have the power to do they would be avoiding taking action and they wouldn’t be taking the issue of plastic waste seriously enough. Especially, as mentioned earlier, they significantly curbed the dispersion of single-use plastic straws. UBC may argue that implementing this change is too expensive. It might not be. The reason for this is that all UBC has to do is simply stop buying plastic bags. That’s it. If they stop buying them, they won’t have any to distribute in the first place. However, if UBC has a contract with a manufacturer, as many retailers do, it might be worth paying the exit clause. A price UBC should be willing to pay. 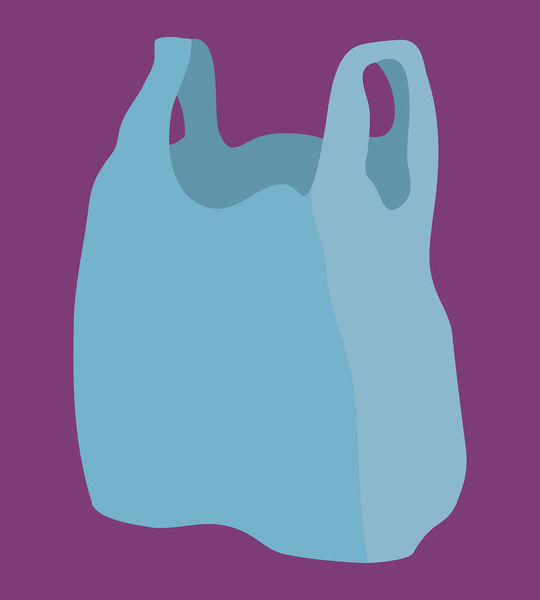 In this case distribution of plastic bags will need to be phased out over some time or immediately if the cost is deemed sufficiently low. “But how am I going to carry my new textbooks?” Most students use a bag in their daily lives anyway. Simply put your textbook in your backpack, satchel or large purse. Alternatively, bring a reusable bag with you when you shop for textbooks and tell the cashier that you don’t need a bag. Is a small fee or tax better solution to this? Maybe. But how much is that fee going to be? A 5¢ or 10¢ fee isn’t really going to deter someone from getting a bag, especially when you consider that the average student spends $760 on textbooks each year according to the AMS. So, you aren’t going to notice a 0.026 per cent fee for the books you buy, assuming you get two bags at 10¢ each. Perhaps a fee based on how much you spend should be implemented. But again how much are you going to charge? The Bookstore would need to charge an amount that will be obviously noticeable yet still affordable so that those who do want to buy it can and a price that does not overextend a student's budget. So a tax could be a solution to this, however, it would take some time to implement and would not reduce the number of plastic bags used as much as simply not providing them. Finally, how will the Bookstore market itself without the plastic bags that proudly display its name and logo? It won’t. Because every single time you or I see that plastic bag we shouldn’t associate it with the UBC Bookstore, instead we should associate it with UBC’s callous perspective on plastic wastage and the hypocrisy it preaches every single time it says that it wants to curb any sort of environmental degradation. The next, of many, small steps for UBC to take is discontinuing the use of single-use plastic bags. It needs to start at the Bookstore and spread out from there. Every single store or service that UBC operates needs to stop providing plastic bags. That includes all faculty stores and any UBC operated Museum gift shop. This may be a minuscule step to tackle the impending problem of climate change, but it’s a small step that UBC can institute right here and right now.